After an intermission of a few weeks due to blog hosting issues, I’m back with more from our trip to Florida in November. 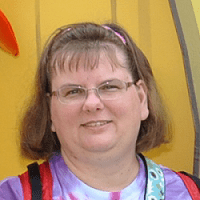 When we got down to Florida, we stayed at the Beach Place Guesthouses in Cocoa Beach. From there it was a fairly short drive to the Brevard Zoo in Melbourne, FL. 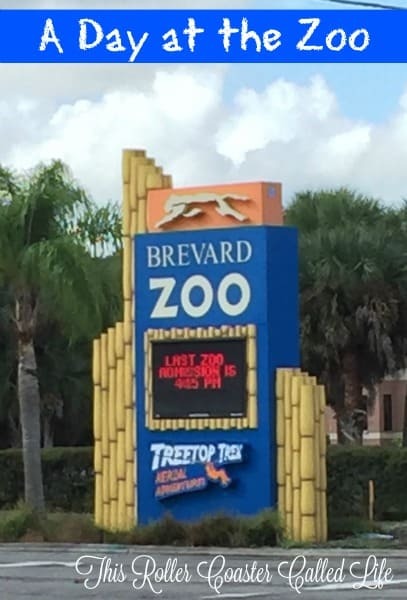 None of us had been to the Brevard Zoo, so we were happy to head off for a day trip there. As you can see from the map, it’s a very good size for a day trip. Also, I appreciated the fact that there were quite a few trees, so we could keep out of the sun. I must point something out here… BEWARE of the birds. There are quite a few BEAUTIFUL birds, like those above, but there are some other birds that are not contained to their habitats. I point this out as I was the casualty of having a large bird poop on me. I could hear the splat as it hit my shoulder! Thankfully, it was contained to my shirt, and Don and Songbird went running to a gift shop to buy me a shirt to wear. This should not be a deterrent to going to the zoo. Just beware of the birds in the trees above you. When we first came in the zoo, we headed right toward the Paws On area. This is a nice place for the younger set of kids. The sting rays are also near this area. 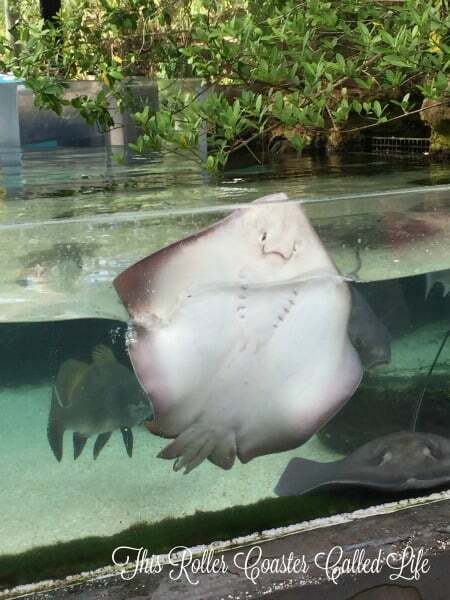 I love watching the sting rays, and evidently, these rays like to be watched. 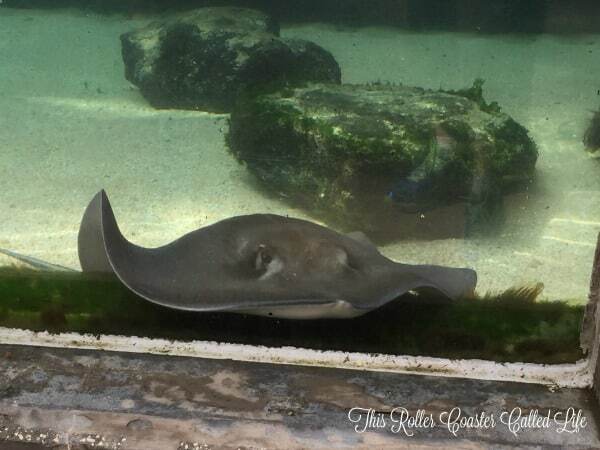 There was one sting ray that seemed to want to get out to meet us. It was amazing to see how far up the glass he was able to get. There were a few animals here that I hadn’t seen before. One of them was the capybara. 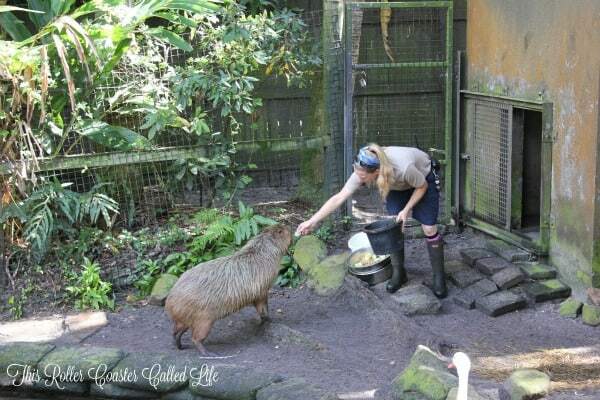 If you are not familiar with the capybara, capybaras are said to be the largest rodents on Earth. They are native to the forests and savannas of South America. Another first for Songbird and I was feeding the birds. The bird on the left is a lorikeet. 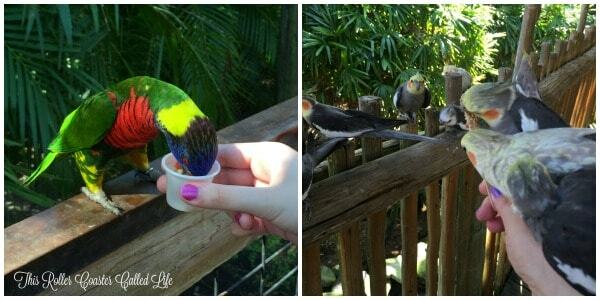 We paid $1 for a nectar cup, and Songbird fed this colorful bird. There were actually a few birds fighting to eat out of the nectar cup. Then, we went into the next section with cockatiels. We were able to purchase sticks covered with seeds for $1 each. This was a free-for-all! As soon as we entered this area, we were covered with cockatiels. At one point, I had four of them on my arm trying to eat off one small stick, and I had one sitting on my shoulder. Now, this last one made me nervous as I was afraid he was going to poop on my new shirt, but he didn’t. Whew! NOTE: This was a rather intense experience, and Marvel Boy wanted no part of it. If you have a child with sensory processing issues, this may not be the experience for him or her. There were so many great animals to see! 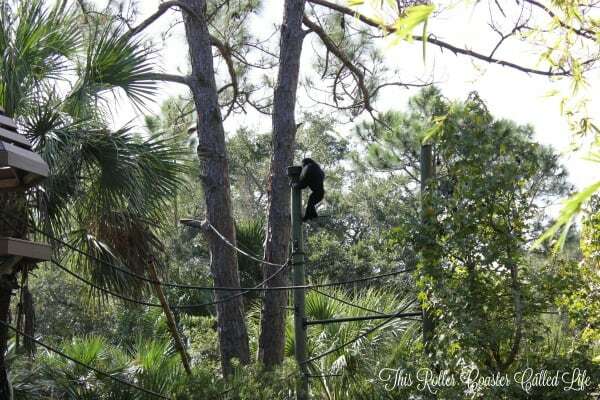 We loved watching this acrobat walking and swinging on the ropes to find his food. 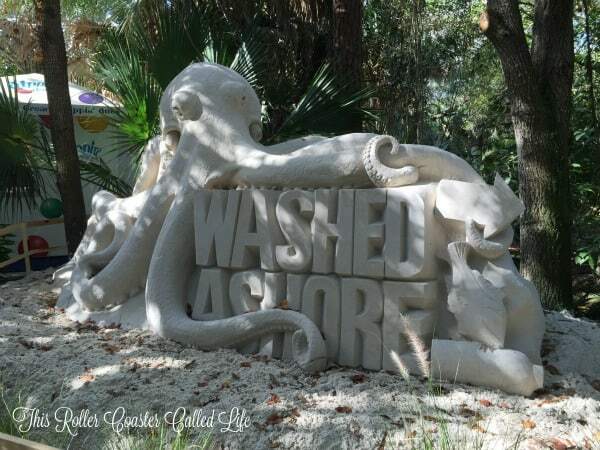 The day we went to the Brevard Zoo was also the first day of their art exhibit: Washed Ashore. This exhibit is on display through May 8, 2016. 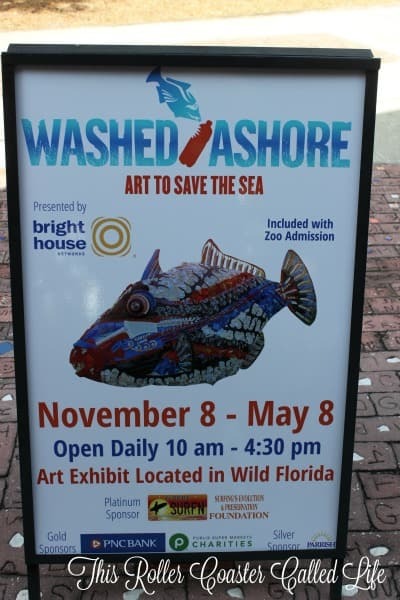 Washed Ashore is definitely a unique exhibit, and it shows just how much and what kind of variety of things that are thrown into the ocean in one way or another. It is mind blowing! Each display has a sign that tells about what the art sculpture is and points out several things that were used in making the sculpture. Almost like a seek and find game. This sculpture even uses the kitchen sink! 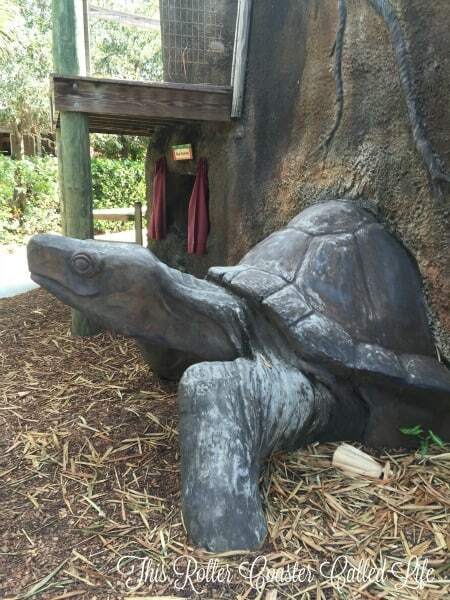 If you have the chance to make it to the Brevard Zoo while these sculptures are on display, it would be well worth it! I don’t want to pictures of all the sculptures here because pictures don’t do them justice, and seeing them in person is much better. Isn’t he adorable? I love how close I was able to get to this “little guy”! 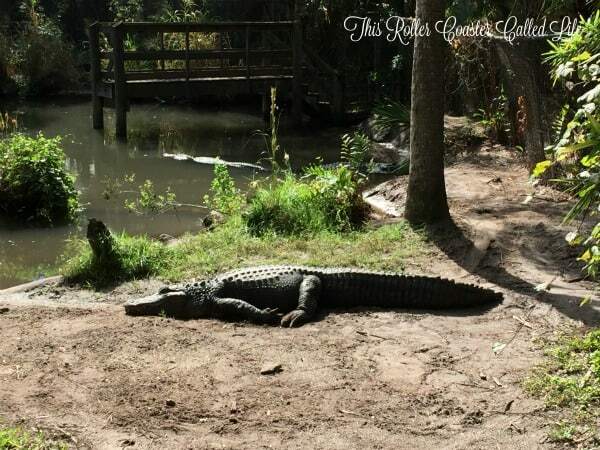 By this time, even with the shade, we were starting to feel like this gator looks. It was much hotter than what we were used to that time of year. Well, it was hotter than Florida is used to that time of year as it was in the high 80s to low 90s. It was time to say goodbye to Brevard Zoo and head back to our hotel for some fun in the water to cool off. Marvel Boy was completely melted at this point, so we took the time to get some up close time feeding this cute giraffe and headed back to the car. 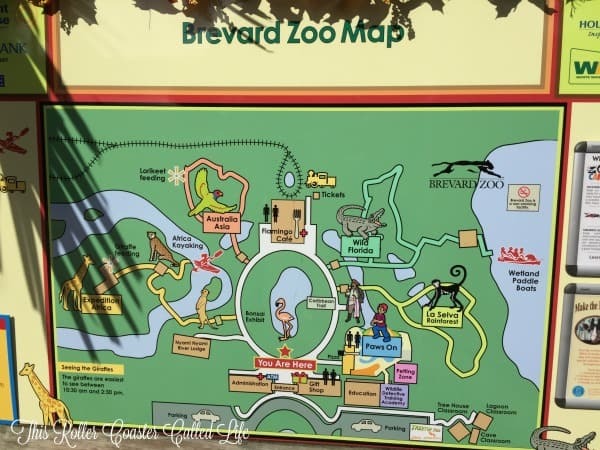 We enjoyed the layout of the Brevard Zoo and all the shady places we found. Highlights? 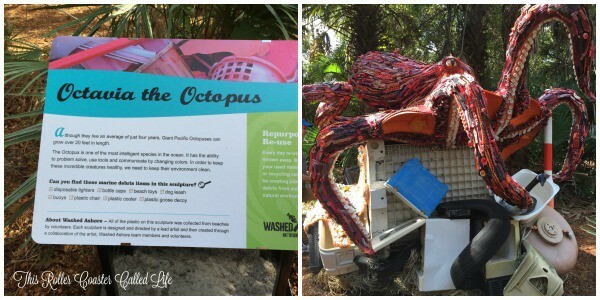 The Washed Ashore exhibit and the bird feedings. 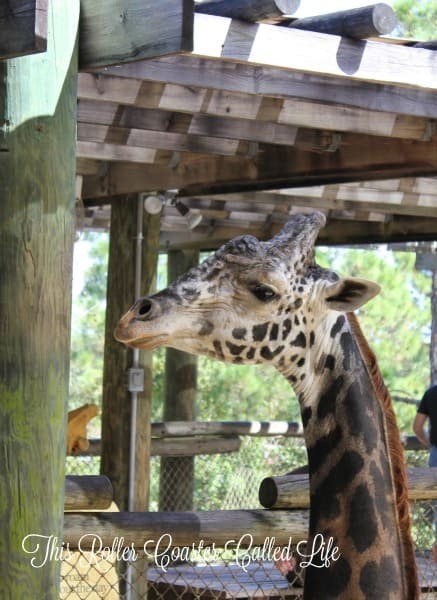 You can easily see most of the Brevard Zoo in one day; however, that is only if you just look at the animals. 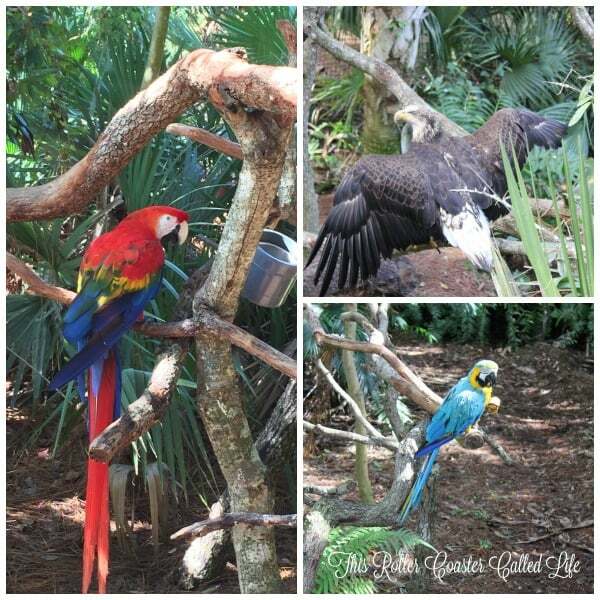 Brevard Zoo some additional activities like kayaking, paddle boats, and wild animal encounters. 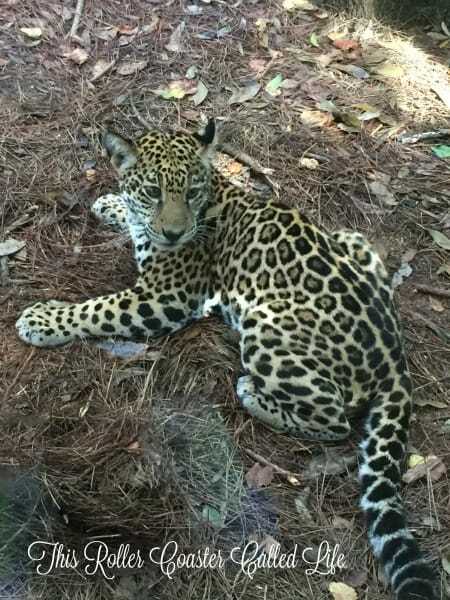 Make sure to check the Brevard Zoo website for zoo information and pricing! Disclosure: We received free admission to the Brevard Zoo in hopes we would share our adventure with my readers. All opinions are my own, and I did purchase my own t-shirt. I love going to the zoo. I have never heard of this one. This one looks like it’s educational and fun. Thanks for sharing.